We can all be involved in chaplaincy." Did you think just like me that to be a chaplain that you had to be a minister? Not so, read on to find out a little about the roles of a chaplain and maybe you'll be surprised! Chaplains are people who are appointed by the Church to work in all kinds of places outside the normal life of the congregation. There are chaplains in hospitals, workplaces, prisons, the armed forces, shopping centres, rural areas, colleges, universities and schools to name but a few. In all these places chaplains try to show God’s love through offering care and support, and by representing Christian values and beliefs. 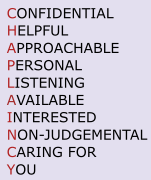 What kind of people are chaplains? Most are volunteers - ordained ministers working full time as chaplains are very much in the minority. A Chaplain could be a visitor at the hospital, part of a team who talk to the staff in the shopping centre or some-one who meets with students and staff at the local College. What Makes a Good Chaplain? Chaplains are pastors: they need to be able to listen with care and attention and seek to be available to those in need. Chaplains are interpreters: they try to understand what God is doing in a particular place and to help the people there to understand God. Chaplains are ambassadors: they represent the Church, and they also report back to the Church about the new insights they have gained. Chaplains are prayers: they pray for the places where they work and when it is appropriate they pray with the people who are there sometimes creating new forms of worship for their context. Chaplains are midwives: enabling the birth of awareness of God in the place where they serve. Chaplains are guests in the institutions they serve, but often work by acting as hosts crossing bridges to provide hospitality and welcome to others. Would you like to find out more about being a chaplain here in Chesterfield? You are invited to hear Canon Paul Morris of Workplace Chaplaincy Derbyshire on Wednesday June 11th. He will give a short talk and then be available for questions and to chat. Two sessions are available 4 - 5.30pm and 6.30- 8pm. Refreshments will be supplied. Watch this space for confirmation of the venue or email jpking@uwclub.net to register your interest.